OSWEGO — Internationally recognized sculptor Coral Lambert will appear at SUNY Oswego’s second annual iron pour at 6 p.m. Oct. 15, on a grassy knoll between Oneida Hall and the Village student townhouses. Visiting artist Coral Lambert will lead the second annual iron pour on Oct. 15, near SUNY Oswego’s Oneida Hall, showing and teaching art and technology students and the public the techniques of cast-iron sculpture. 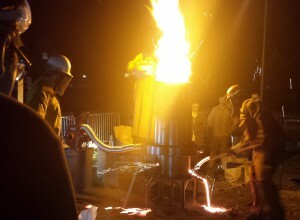 Pictured, a sculptor works with molten iron (bottom center) in the inaugural event in 2014. The fiery display will accompany a free presentation to show and teach students and the public the age-old sculpting and manufacturing technique, featuring the shaping of its main raw material, molten iron. Parking for the event will be available only in Lot R-13 across Iroquois Trail from Oneida Hall. Art faculty member Benjamin Entner, a sculptor, and Richard Bush of technology, whose classes include materials precision production, will collaborate with Lambert on the event. Head of sculpture at Alfred University, Lambert contributed “Shape Shifters,” one of six pieces in SUNY Oswego’s year-old display of outdoor sculpture near Marano Campus Center. She directs the National Casting Center’s Foundry Program, and is a past chair of the International Conference on Cast Iron Art. Among her honors are the Gottlieb Foundation Award, the Jerome Fellowship and the Joan Mitchell Grant. In an artist’s statement, Lambert wrote, in part, “The dynamic forces that are evident in nature are difficult to map out but they can be given a chance to manifest and teased out within the making of the piece through working physically, grappling with material and process. Through working directly with melting and casting metal, I can respond to its transient liquid state, as well as to its weight and permanence: Like wood, metal can be experienced as a living material as it breathes, oxidizes and grows. SUNY Oswego’s first iron pour, last Oct. 16, featured artist Edward Kelley of Drake University in Des Moines, and coincided, as a fiery exclamation point, with the end a long day of events kicking off the college’s $40 million “With Passion and Purpose” fundraising campaign.